Woeser showing her father’s photos of the Cultural Revolution in Tibet to the Associated Press journalist. (Associated Press, January 21, 2015). 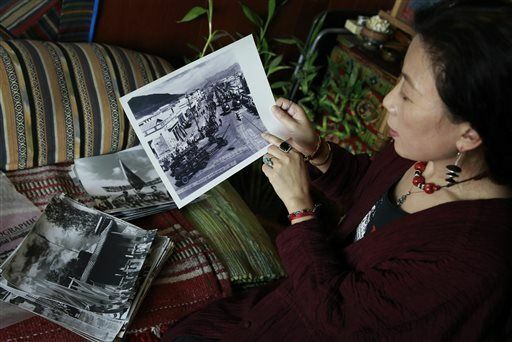 High Peaks Pure Earth has translated a blogpost by Woeser that reflects on her father’s photos of the Cultural Revolution in Tibet. On March 11, 2015, under the title of “Secret Historians Preserve Past in China Amid State Amnesia”, the Associated Press reported on three people living in Beijing, including myself, who have worked hard many years on recording, storing and making public the dark history of the Chinese Communist Party. The Associated Press journalist visited me at my home in the eastern suburbs of Beijing and came to see over one hundred photos that do precisely this: they “preserve the past”. These photographs were taken by my late father. They show scenes of destruction in Lhasa and other Tibetan areas as the Cultural Revolution swept across the country. These photographs were secretly developed in 2000 by my husband Wang Lixiong. I told the Associated Press journalist how over six years I conducted research and interviews in Lhasa and I started writing based on those photos. I interviewed over 70 people, mostly Tibetans, but also some Chinese and Hui people; they included retired cadres, soldiers, workers, residents, a few officials, some scholars still working within the system and devout monks. Some of them had been Red Guards, some part of the “Rebel Factions”, some denounced as “monsters and demons” and others been “enthusiasts”… I carried the photos around Lhasa’s streets and alleys, secretly engaging people in conversations. 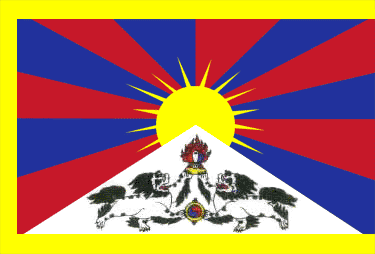 Gradually, a wiped out era reappeared and a Tibetan past that had fallen into oblivion slowly recovered. “Fighting the power also means fighting amnesia”. “A lot of people have already died,” I said, “so I think this is a very urgent thing. Because memory is important to people, and if the person is there, the memory is there. If the person isn’t there, then the memory has disappeared.” This collection of photographs and related materials were published in 2006 in Taiwan entitled “Forbidden Memory: The Cultural Revolution in Tibet”. In 2016 a second edition was published with additional photos and text.